Replacement cover rubber mats used to block open bore holes and protect your table from debris when machining on our hole matrix tables such as GR , S..
Our holed rubber mat with 10 mm grid for our hole matrix tables where maximum bore holes are required to be open for clamping small parts.Each pack in..
Our holed rubber mat with 20 mm grid for our hole matrix tables where maximum bore holes are required to be open for clamping small parts. Each pack ..
Our sintered mats are a harder wearing rubber mat than the clamping fleece, for use on routers with a hole matrix vacuum table where breakthrough mill..
Our vacuum clamping fleeces offer many advantages compared with other mill-through mats. An affordable mat which is easy to place allowing you to per..
A precision mat is a must for many vacuum clamping and CNC machining. All our mats are compatible with our vacuum table range and provide a good and reliable tolerance. Custom sizes are also available - contact us for more information. Our DIY CNC vacuum starter kit 01 features a cast aluminium R Series Grid vacuum table, venturi adapter and our special clamping force boo..
Our DIY CNC vacuum starter kit 02 features a cast aluminium R Series Grid vacuum table, venturi adapter and our special clamping force booster. 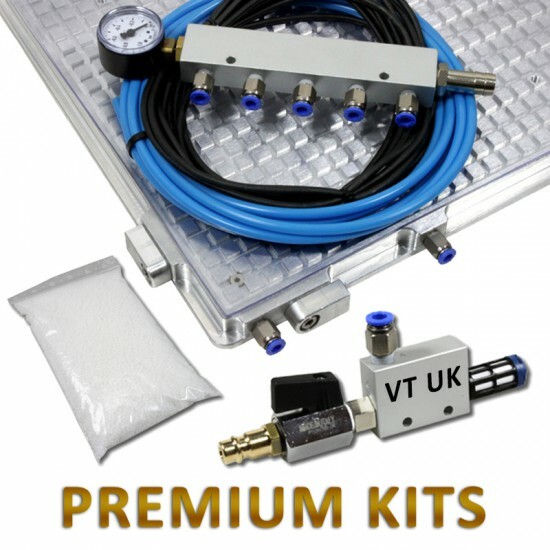 ..
Our DIY CNC vacuum starter kit 03 features a cast aluminium R Series Grid vacuum table, venturi adapter and our special clamping force booster. ..
Our DIY CNC vacuum starter kit 04 features a cast aluminium R Series Grid vacuum table, venturi adapter and our special clamping force booster. ..
Our 3020 RAL Premium vacuum clamping kit contains all you need to get started with your CNC vacuum clamping project.This kit features our premium RAL ..
Our 4020 RAL Premium vacuum clamping kit contains all you need to get started with your CNC vacuum clamping project.This kit features our premium RAL ..
Our 4030 RAL Premium vacuum clamping kit contains all you need to get started with your CNC vacuum clamping project.This kit features our premium RAL ..
Our 5030 RAL Premium vacuum clamping kit contains all you need to get started with your CNC vacuum clamping project.This kit features our premium RAL ..
10 meters of foam rubber, 4mm in diameter. Suitable for all RAL vacuum tables tables and vacuum pads with 4mm grooves..
Our Venturi vacuum generator VT-VE1 provides five times more holding force than that of a standard vacuum cleaner.And fits all our vacuum tables with ..
10 pack of steel T-slot nuts with M8 thread for steel T-slot plates.For DIN 508Thread diameter: M8Material: SteelB = 15 mmL = 15 mmH = 12 mmH1 = 6 mmA..
Our Venturi vacuum generator VT-VE1.5 provides much more holding force than that of a standard vacuum cleaner.And fits all our vacuum tables with 4 mm..
Aluminum T-slot nut with M8 thread Pack of ten.For DIN 508Thread diameter: M8Material: AluminiumB = 15 mmL = 15 mmH = 12 mmH1 = 6 mmA = 9.6 mm..
Height-adjustable clamp made of cast aluminum.Clamping height: 4 - 45 mmMeasurements:L: 50 mmB: 20 mmH: 10 mmh1: 50 mmD: 6.5 mmd1: M6e1: 10 mme2: 20 m.. Specifications:Chuck jaw measurements: 150 x 39.60 mmChuck jaw material: AluminiumBody material: Anodised cast aluminiumPressure: 2 barLift: 5 mmDiame..
Have the flexibility to machine small parts using just one Pad or link together to make a series. Allowing you machine all the way through with no loss of vacuum. Push the envelope of what can be achieved with a standard vacuum clamp. All our vacuum tables come complete with all connectors, hoses and accessories you need to get started with your vacuum clamping project. 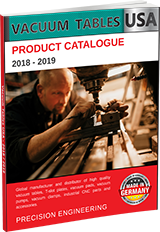 Read our guide on which vacuum table is suitable for your machining needs. Need a custom T-slot plate? Our exclusive custom design and manufacturing process allows you to have your own custom T-Slot Plate manufactured with our exacting standards. Contact us to request your custom T-slot quote. With pumps rated at both 230v and 400 volts our range of industrial CNC vacuum pumps and generators suit almost all requirements. A vacuum pump is often one of the most difficult choices when building a CNC vacuum system. Read our guide on which vacuum pump you should use here. Our 3020 RAL Premium vacuum clamping kit contains all you need to get started with your CNC vacuum clamping project. This kit features our premium RAL Series 3020 vacuum table and all accessories you need to get started. Whatever you're wanting to achieve with your CNC milling, our custom design service allows you to specify your exact size, measurements and modifications for your own bespoke vacuum table. You can discuss your requirements with our engineers and technical team, we can provide 3D CAD drawings or let you supply us with your own technical drawing. Our exclusive custom design and manufacturing process allows you to have your own custom T-Slot Plate. Discuss your requirements with our engineers and technical team, we can provide 3D CAD drawings or supply us with a CAD file you need. We can help create your exact requirements and the perfect T-Slot plate for your CNC needs. Part of CNC Plus Ltd.